Cloudonomics, including hybrid cloud, network on demand, network management, pay-per-use business models, and third-party SIP devices. Much of the discussion focused on the cloud (of course), as well as ALE’s focus on five key verticals. ALE’s cloud strategy is different from most other vendors, with a couple exceptions, as the company has a large installed base of premises-based customers that want to retain and leverage their equipment while slowly migrating to the cloud. With 45 million users, ALE needs to ensure a migration path to the cloud that will work with its customers’ timelines and goals. ALE introduced “Rainbow” several years ago as a way to provide overlay cloud services on existing solutions to let the customer keep their investment. In the past couple of years Rainbow has become both a UCaaS and CPaaS offering, focusing on a hybrid deployment approach. In addition to Rainbow, ALE has a range of cloud offers, including a service offering for carriers, SMBs, and enterprises. Its private cloud offering, the OpenTouch Enterprise Cloud (OTEC), has been available for a while and continues to grow. ALE has a large global installed base of premises-based customers, but also has 1 million cloud users. The number of cloud users is growing, as ALE will eventually migrate a large portion of these customers to the cloud. ALE’s primary cloud offering is Hybrid cloud. Rainbow provides UC and enhanced capabilities and works with existing premises-based PBXs that provide the call control (these can be ALE or third-party PBXs). 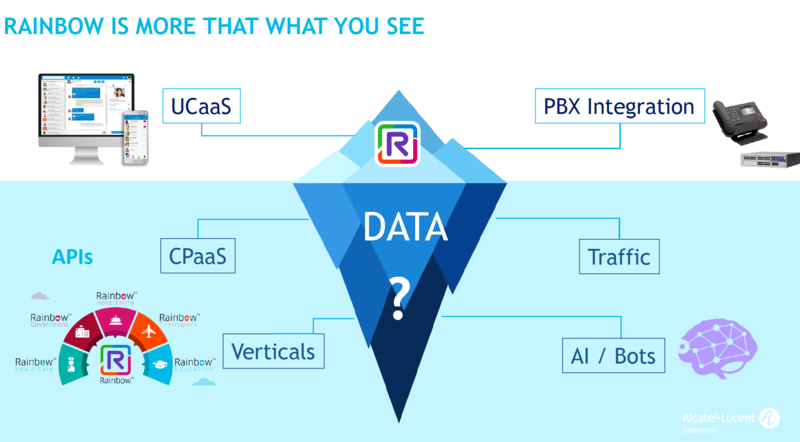 According to Stan Corporeau, ALE has more than 5,700 PBX systems connected to Rainbow and more than 17,000 PBXs registered to Cloud Connect. A new “pure cloud” solution is available as part of Rainbow, leveraging the new Rainbow Voice, based on Sipwise. ALE now offers multitenant voice capabilities for customers that don’t have or want to use a PBX. This is currently a limited offer and only available in a few regions. ALE offers both telephony and networking and can offer an end-to-end solution that includes networking as well as endpoints. This is a competitive differentiator, as not too many vendors still offer both networking and telephony. ALE has strong vertical expertise and is leveraging its CPaaS capabilities to provide enhanced value to five key verticals – education, hospitality, healthcare, transportation, and government. The company discussed and demonstrated interesting vertical applications such as smart cities, safe schools, and “smart surgery“ leveraging communications, collaboration, networking, devices, and more. With its Rainbow CPaaS capabilities, ALE is also focusing on IoT and AI, and introduced its IoT hub and the Rainbow API Hub, which includes 150 APIs and four SDKs, as well as documentation, examples, samples, sandboxes, and more. CPaaS is a big part of ALE’s vertical focus, and enables the connection to IoT devices, AI, customer engagement, etc. Every service in Rainbow is now available as an API. AI is an important area for ALE, and the company is integrating IBM Watson to provide Cognitive Communications. AI and natural language processing are being used in a variety of areas including smart bots for the contact center, as well as for enhancing meetings, and to improve network operations. During the ALE analyst conference, I spoke with Matthieu Destot, COO, about the key messages of the event. He discussed ALE’s vertical focus, cloud and cloud offerings for partners, and the various deployment models for customers. With its long history in the industry, ALE has a range of communications and networking offerings. It has a large installed based on premises-based products, including OmniPCX Enterprise (OXE), OmniPCX Office (OXO), and the OpenTouch client. In this video, Nicolas Brunel, EVP Communications Business, discusses ALE’s various communications products and platforms, including OpenTouch, OXE, and OXO, as well as Rainbow and Rainbow Voice cloud services. He also discusses CPaaS and ALE’s Rainbow API Hub and how customers and developers can use ALE’s APIs for developing applications. 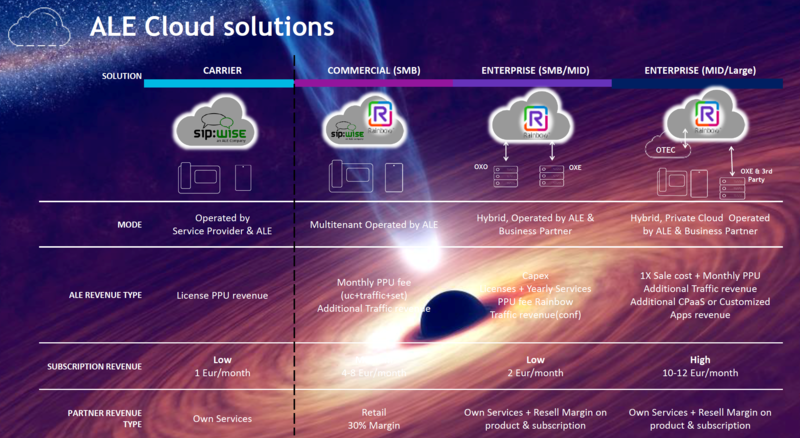 To get into more detail about Rainbow and ALE’s cloud offerings, I spoke with Moussa Zaghdoud, VP Cloud Business. In this video, he discusses Rainbow and how it provides a hybrid solution and connectivity to existing phone systems. He also describes Rainbow Voice and how Rainbow can provide an end-to-end cloud solution for customers. Zaghdoud also discusses Rainbow CPaaS, and the strong growth in the number of developers using ALE’s APIs to build applications and solutions on top of Rainbow to solve specific customer problems. Nemo Verbiest, VP Digital Workplace at Dimension Data, described the company’s digital workplace strategy and what the company is doing to innovate. He explained that ALE’s vertical approach and cloud focus is a good fit with Dimension Data, and the companies are both focused on outcome-based digital collaboration in order to ensure adoption. To expand on ALE’s approach to AI and partnerships, I spoke with David Thépot, Business Development Director Verticals & Partnerships. In this video, Thépot discusses ALE’s AI strategy and relationship with IBM, as well as other partners such as PGi. ALE has more challenges than some of its competitors as it needs to walk a tightrope between innovation and nurturing its installed base. Rainbow is a great example of how ALE is helping to bridge two worlds. While the company has always been a leader in innovation, it seems to have fallen behind a bit lately. It will be interesting to see how the company advances in areas such as IoT and AI and if it can differentiate itself in these areas. Having a large installed base is both a blessing and curse for ALE, as it needs to continue serving the needs of these customers while moving into the next phases of digital transformation and the cloud economy. If ALE can find the right balance and continue to innovate and provide value in areas such as IoT, AI, and CPaaS, while offering a path to the future for its installed base, then the company has a bright future. It will be tricky, however, as new competitors can move more quickly and introduce innovative solutions without worrying about a legacy installed base. ALE’s focus on CPaaS and vertical industries will certainly help. It will be interesting to see how ALE fares in its next 100 years.